1. 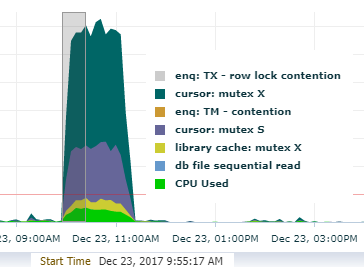 Around 9:55 database started performance bottleneck on 23rd of December due to soft parsing in library cache (library cache:mutex X). We see sqlid 4h5gmrxn4dkm3 was causing the spikes. 2. Now Question is why soft parsing of sqlid 4h5gmrxn4dkm3 spikes and makes bottleneck as its normal behavior in oracle? From the bottle neck picture, its visible system is loaded with heavy mutex X/S wait and this is for high number of cursors (version count). I see version count for sqlid 4h5gmrxn4dkm3 is 952. 3. Now question is why so many version count for sqlid 4h5gmrxn4dkm3? After investigation, I see this is because of bind mismatch. event="106001 trace name context forever, level 200"